There are some websites which require you to visit them using Internet Explorer only, I don’t know why but there are some. My friend had to download an important document from a site which insisted on using Internet Explorer. We both are in Linux, Fedora. Is there a way? Yes there is. The browser version and certain system details are stored in the browser configuration, and this sting is called the useragent string. The information in this string is used to detect what browser you are using. Therefore if we can modify this string such that it looks like we are using Internet Explorer instead of Firefox, then we can fool the other end. After doing this the server side will believe that you are using an InternetExplorer browser or any other browser (also a different OS), depending on what the useragent string you are using to override the original. Instagram does not allow you to upload pictures from desktop/laptop. Using this method you can set the useragent string of your desktop/laptop browser to an andriod or iOS browser and upload pictures to Instagram from your desktop. What we need to do is simple. 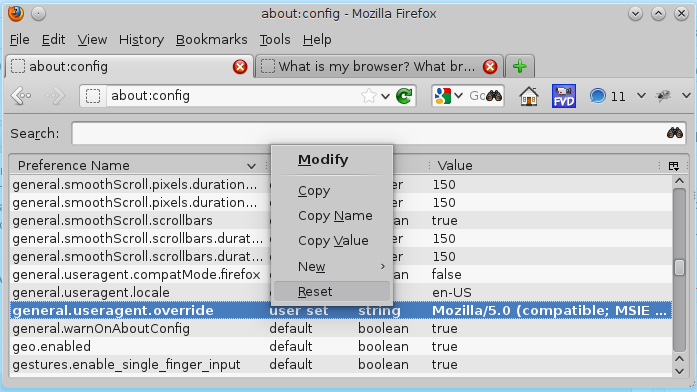 Just create a new entry in firefox browser configuration and set the value to appropriate useragent string. So let’s get started with this short and quick guide. 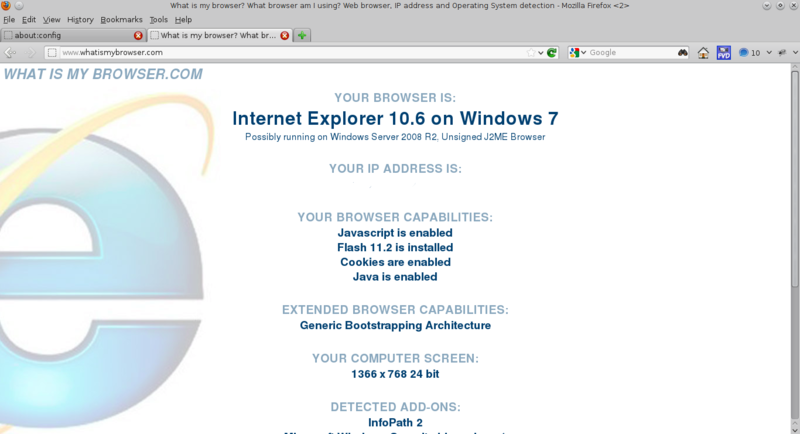 First check your useragent and detected browser from http://www.whatismybrowser.com/ before starting. 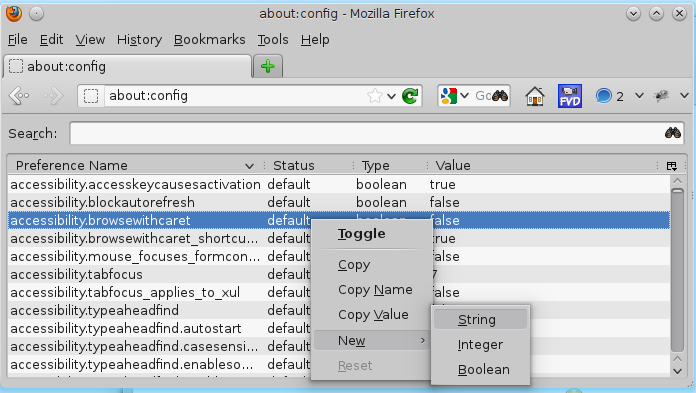 Open a new tab in firefox and type in about:config in the address bar and press enter. Click on the “I’ll be careful, I promise!” button. (Don’t worry, you won’t mess anything). Next, right click on anywhere in the page and select “New->String”. In the “Enter the preference name” box enter “general.useragent.override” (without the quotes) and click ok. 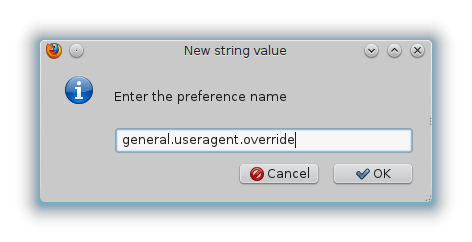 In the next box you need to enter the useragent string for the preference “general.useragent.override”. You need to enter an appropriate useragent string in this box. For InternetExplorer you can use this list: http://www.useragentstring.com/pages/Internet%20Explorer/ of user agents (other browser useragent link below). Just copy one of the useragent strings from here and paste into this box, and click OK, and you are done. And you will see that the entry you just created is visible among the others. To view it you can enter “general.useragent.override” in the “Search:” bar above. Now again visit http://www.whatismybrowser.com/ and check what browser and OS is detected, and you will see it will detect browser and OS depending on what the useragent string says. Whenever you want to return back to your actual browser configuration, just reset the value of this string by right clicking on the “general.useragent.override” entry and selecting “Reset” menu option. The useragent string is actually composed of different components each describing some aspect of your system. But you do not need to understand them inorder to get this to work. 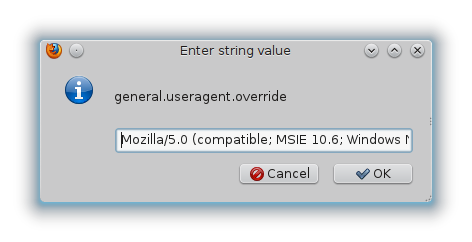 If you want to override your browser’s useragent string to some other value then you can refer to this page: http://www.useragentstring.com/pages/useragentstring.php. 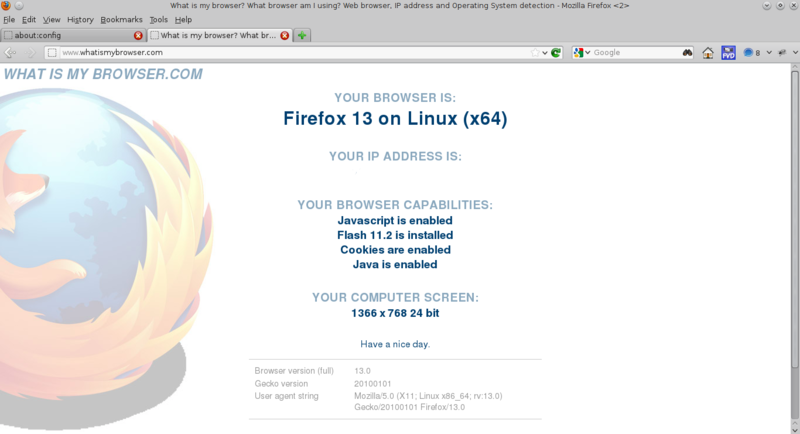 Just an appropriate browser to get useragent strings of different versions and other info (OS etc.). 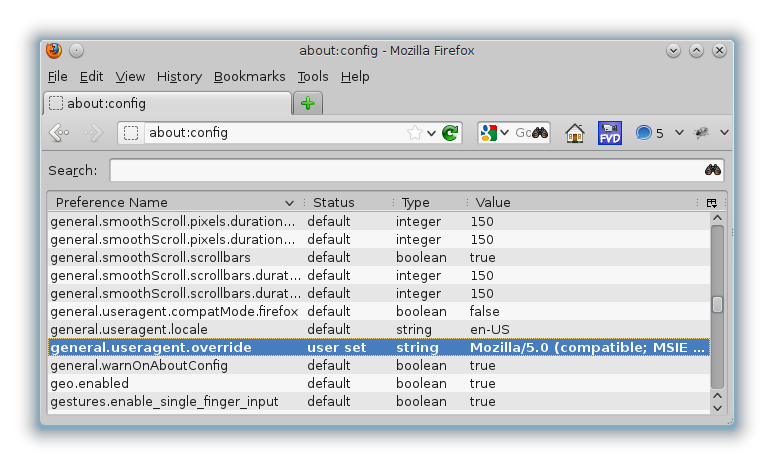 Also you can check out what are the components of the useragent string in http://www.useragentstring.com. By understanding each component of the useragent string you can gain fine grained control and make your own string. This enabled my friend download his important document, did it help too?